As you become more successful in your career, and gain more and more responsibility, you’ll probably find that your available time becomes less and less. It’s important to be aware of your productivity and the typical ways that you tend to loose time. Understanding your time wasters is important, as are developing tactics to increase your productivity. Often the hardest part is getting going. Start whatever it is that you’ve been putting off. Once you get going you’ll probably find it wasn’t as difficult or as awful as you’d thought. Try to tackle your least favourite task first; perhaps it’s addressing that difficult problem; get it over and done with and then you can happily move on. You cannot work productively for long periods of time. It’s a well know fact that your quality of work and focus begins to stray if you work without any break. Get away from your desk; go for a walk and get some fresh; giving your brain the opportunity to think about something else will help you feel rejuvenated when you get back to work. Don’t have the Internet up in the background on your screen; it’s only a constant distraction and temptation to go and do some browsing. Think of visual distractions. Do you sit facing a busy walkway with many people passing your desk and saying hi? Maybe it would help to face your desk in a different direction. 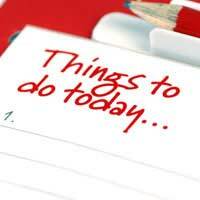 Have a daily to-do list and focus on what really needs to be done. Getting distracted by non-essential tasks can be time-consuming and stressful. Be goal driven. Looking for things, even your stapler, wastes time. Trying to track down important documents can be time consuming as well as stressful. Take a few minutes each day to get yourself organised. Don’t forget to use your calendar and agenda so that you are on top of your daily activities. If you have a team then get delegating. They will appreciate the responsibility and opportunities, and it will free your time to focus on other more important activities. It’s unrealistic to try and do everything; therefore learning to say no is an essential skill to be successful in business. Emails come into mailboxes at an ever-increasing rate; It’s easy to spent an entire day simply responding to emails as they arrive. By setting regular times to manage your emails means that you can avoid the frequent interrupts of emails and give yourself periods of time where you can focus on the activity at hand. One finger typing and poor typing skills is time consuming and reduces the quality of your work. Increase your typing skills and speed and you’ll save a lot of time. Try not to have too many activities on the go at the same time. Focus is important, so try to limit the number of major activities requiring significant involvement from you. Eat well, plenty of sleep and exercise, and you’ll have more energy to face your day. You’ll also cope with stress better. Have a meeting in person, rather than sending that email. Make notes in a pad down in the coffee shop. A change in environment can be stimulating and help you come up with new ideas. Or maybe it’s a sign saying that you don’t want to be interrupted. The message is the same: that you don’t want to be disrupted. Giving yourself an hour of uninterrupted time allows you an opportunity to concentrate and focus. Stick to the same time and your colleagues will get use to it. As your time becomes more and more scarce it’s important to understand what your time wasters are and to develop personal tactics to manage these tasks. Perhaps it’s as simple as allowing yourself half an hour each day to visit your favourite websites. Develop ways to make the most of the time that you have available, so that you minimise disruptions and ensure you are at your most focused. Finally don’t forget not to skip meals, get some exercise and look after your health. These are important aspects to increasing your productivity.